During the cold seasons it is important to keep warm, but instead of using up energy with the central heating, I think a much nicer way of keeping warm is with a hug. Now I have never been much of a people person, so I much prefer a hug from something furry. Many might choose a dog to be their heat generating companion, but for me it is a bear – better yet, a whole hug of them. Getting personal with a real live grizzly is not particularly advantageous to one's health (it will most likely have the opposite effect), but there is nothing quite as comforting as cuddling a teddy bear. Last September, my mum and I were arctophiles on a mission: to increase our already humongous hug (the collective noun for a group of bears) by attending Teddies 2015. The bi-annual festival is held at Kensington Town Hall every six months, and their next one, Winter Bearfest, will be on the 28th February 2016. If you like bears and are interested in going, then here I share my experience so you can get a feel for what it is like. Standard entry is only £4 for adults and £2 for children, at the door, but if you're smart, you can even save yourself this small fee. Simply by registering to Hugglets you will receive one free ticket, plus a catalogue that contains two more free tickets at the back. It opens at 10.30am and early queuers get handed out free chocolate. Once you hand in your ticket, it will then be put into an hourly prize draw (from 12pm), which could win you £50 of vouchers to spend on the day or at the next event. There are three floors filled with stalls, but as the show lasts until 4pm there is ample time to see everything several times over. The first lady you will see is Dot Bird, who always occupies the hallway. She is a teddy bear doctor who performs surgery on octogenarian bears in need of a bit of TLC. Dot is a miracle worker with a needle and thread, restoring vintage bears so they can be loved for another fifty years. She does not have a website, but you can call her on 01765 607131 or email dotsbears@btinternet.com. Through into the main hall, I barely had the chance to glance at a few dolls' outfits before Mum let out a gasp and made a beeline for the Tillington Bears stall. Her sharper-than-usual eyes immediately spotted some unique hares with a slender frame, long ears, slit eyes, and sitting in a very gentlemanly fashion. She had bought a silk hare from Tillington's at the last show, so it is obviously an artist she is drawn too. On our first visit to Hugglets we spent ages at every stall, but we've noticed that since then we have become more discerning because we are aware of which artists we really like and which ones we are not so keen on. For example, another favourite of ours is Bisson Bears. Gail Thornton, the artist, named the company after her mother's maiden name, and she creates the most gorgeous mohair bears. They come in all sizes, but even the very smallest bears are very weighty because she fills them with steel pellets. Typically the one I fell in love with was the biggest of them all, and cost over £700. She understands that her big bears are out of most people's price range, which is why she also designs seven-inch bears, which are more affordable. Saying that, we met a woman on our way round who had bought a large pink tinted Bisson. I have always been a fan of Paddington Bear, but since the Paddington movie came out, it is no surprise that this Peruvian stowaway has become much more popular with a wider audience. I saw proof of this at the show, as at least three different artists had created their own versions. A German lady had made two Paddingtons, one of which came with his suitcase, while the other with a red telephone box. Another artist had made three different sized Paddingtons, and gave each one a different expression by the way she did the eyes. All these bears were quite small in size, but the third artist did a beautiful bear in large scale, complete with marmalade sandwiches. Bears are not the cheapest thing to start collecting, and often difficult decisions have to be made on who to buy and who leave behind. While you should only ever shop within your means, it is also important not to go away kicking yourself at the end of the day. Mum did this last February with a bear called Brandon. She let him go and had been regretting it ever since. But it must have been destiny for her to have that bear because he made an encore appearance in September. She was not going to let the opportunity slip by a second time, and so the lovely chappy came home with us. As well as the seasoned regulars, there were a number of new artists at the festival (or at least ones I couldn't remember seeing before), one of whom was Gill Cattrol who runs Bower Bird Bears. Gill was lovely to talk to as she explained the story behind some of her creations. Both my mum and I really liked her Bertram Bunny, which was part of an upcycling project. A friend gave Gill leftover material from a tapestry tablecloth and asked if she could do anything with it. Gill combined it with vintage Russian plush and Bertram was born. Not all the dealers are artists; there are several stockists too. One of my favourites is The Bear Shop, who offer a 10% discount at the show. The other reason I like them is because their main stock is of Charlie Bears, my favourite bear company. On this occasion they had a bear from the new – yet to be officially released – collection, and it was great to have a sneak peek. Another stockist also had a bear from the new collection, called Hunky Dory. He was indeed very hunky, and I absolutely adored him. The combination of his size, being made from mohair, and the fact that he was a 'giggler' made him too expensive, however, so I had make a sorrowful parting. A lot of artists like to give their bears a 'tired out' appearance to make them look as if they are older than they actually are. 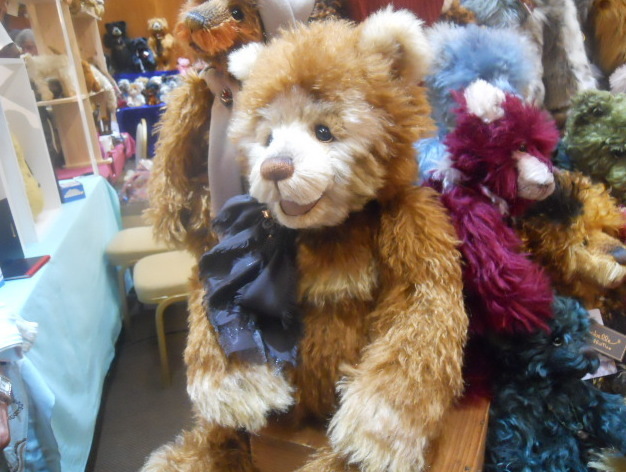 If you are after the real deal, however, then there are plenty of dealers with antique and vintage bears for sale. Many of these are actually auction houses, such as Vectis and SAS. The most common place to put a collectable bear is on a shelf, but if you feel like your bear deserves something a bit more comfortable, a bit more regal, and that bit more special, then why not buy them some furniture? The festival features two furniture crafters, both with a very different style. First there is Chris, who makes traditional, practical wooden benches for small (about seven inch) bears. Well aware of space issues, Chris invented brilliant double and triple-decker benches that can fit up to about fifteen small bears in a confined space. He offers great value for money, with his chairs and benches costing from as little as £3 up to about £35. Phyll, on the other hand, designs ornate, cosy armchairs for slightly larger bears (about fourteen inches) that make them look like royalty. These do come with a heftier price tag attached, with her 'Stars and Stripes' armchair priced at £50. While some artists create anthropomorphic style teddy bears that can sit down on chairs and wear clothes, others try to make their bears look as realistic as possible. Bear Bits do outstanding work with the anatomy of their bears by adding extra joints in the wrists and knees, as well as giving them a bendable spine. The artist, Bill Ashburner, demonstrated to me how posable this made them. They could sit up, lay flat, walk on all fours, or stand on their hind legs. Then there is Schnoggy, who is first and foremost a photographer. During her travels she has taken the most beautiful photographs of bears in their natural environment, and then recreated their poses into realistic figures. Perhaps all these fabulous artists have inspired you to have a go at bear making yourself. The prospect can be rather daunting, but at the festival you can find lots of things to help you out, including DVDs, books, fabric, patterns, pellet fillings, and information of bear-making workshops. Whether you are a newbie, seasoned collector, or dabble in making teddies yourself, the Winter Bearfest is a brilliant event that you won't want to miss.